I know that cracked.com isn’t always the most sophisticated place to draw inspiration, but one of its articles makes some interesting points (that may or may not involve naughty words). The thesis here is that some science fiction worlds are so compelling (and in some cases artistically important) that the plots they support are of low importance, an afterthought. Not a shocker, but Robert Brockway’s point is that it’s sometimes best that way. Here’s how I generally think of it: The risk with science fiction and fantasy is that the setting can overwhelm the plot of a given story. When things go wrong, it’s because of too little character and too much unessential detail. Too many descriptions of the robot’s gears. Too many breeds of unicorns. Too many syllables in the character names. Too many planets with too many indistinguishable moons. In theory, I’ve always known that story can’t be in service of touring the setting. The story should be intertwined with the setting, but if you don’t have characters doing something meaningful, you’re cheapening the whole enterprise of writing. And by the time you reach the word “cheapening”, you should probably see that, for me, this notion is like a cautionary tale. Overindulge in world-building and you might turn your story into an encyclopedia of your own world of pretend. 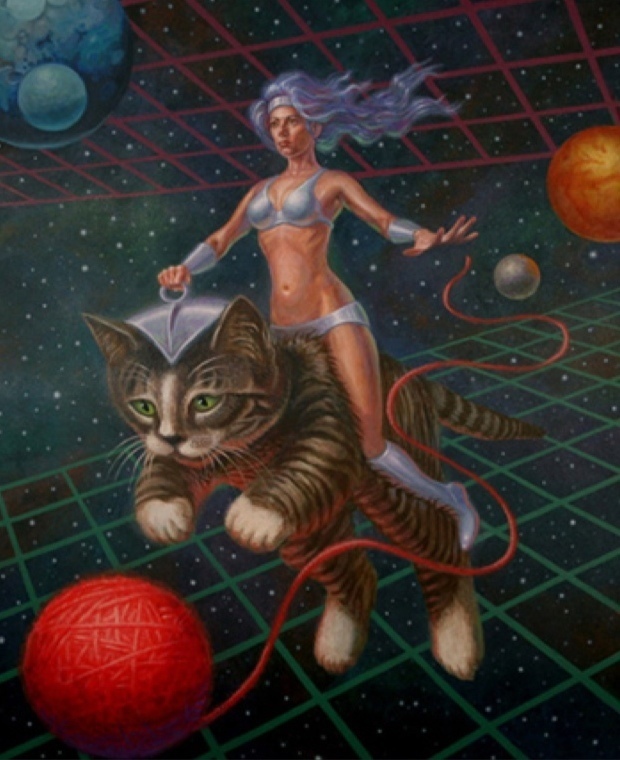 If you aren’t careful, you end up writing about bikini clad ladies riding space kittens. And then it all ends in tears. But Brockway (who makes some poop jokes in the course of his reportage) argues that settings like that of George Orwell’s 1984 are more significant that their plots. Certainly, something has to happen in the story for it to be worthwhile. Or a story at all. But the plot of 1984 is largely the story of a forbidden love affair. It’s the chillingly imagined world that we remember. Here is my confession. I have written three different novels in the same, very personal version of Neverland: one about working class street fairies, another about lady pirates who circle the island long before Hook arrived and finally the one I’m finishing, which centers on a mermaid investigating the murder of another, more glamorous mermaid. I’ve spend years, off and on, swimming around in this world. I can tell you the most intricate details about the economy of fairy dust – How it’s made from the corpses of fairies. How the demand for it among humans funds everything from fairy orgies to libraries. I can even tell you how the paper in the books of those tiny libraries is created, but I’ve always been faintly embarrassed that I’d thought these things through. Shouldn’t I have been considering character explicitly? Or thinking deep thoughts? Or doing my taxes? But imagined worlds are also commentaries or critiques of real ones. Sometimes world building is more than just escaping reality (although I do love that part too); it is also a lens without which you would see nothing special at all. Considering how many times I’ve read Peter Pan, you’d think I’d have learned about the transformative power of a pretend place long ago. This is an incredible post! Not only does it provide an elegant and eloquent excuse for your prolonged residence in the world of Neverland, but also I love the proposition that when setting is all, plot doesn’t need to compete. In fact, it seems that to look for plot when the setting is rich is to miss the way the story is supposed to be read. Never again will I complain about a thin plot, and be shown to be intellectually deficient. By the way, I just finished The Invention of Hugo Cabret, and for some time I was complaining about the plot as i was reading. And then suddenly, the pictures, the world of the station and the cinema, all of that took over and I realized the real beauty of the story. Thank you for the very brainy and stylish post. There’s a woman in 1984? I’m kidding. I remember that book.